The Dorset Art Weeks 2012 Auction is now over, if you missed it you really missed out on an opportunity to buy a piece of Simon Thomas Pirie Furniture at incredible prices, sorry! The furniture included in this auction is speculative work and ex-show pieces that are for sale well below the usual commission price. Every few years we sell-off show pieces in order to make new speculative work and try out new design ideas. We have already had to withdraw two items – a large table and a pair of Impala chairs, as an existing client has snapped them up! So how is this going to work? Those familiar with ebay will understand the ground rules. We display the normal ‘commission’ price, the ‘reserve’ price, that I won’t take an offer below, and a ‘buy it now’ price, to secure it immediately. 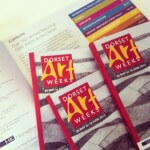 The duration of the auction is basically the duration of Dorset Art Weeks – from 10am on Saturday May 26th, with all bids closing at 5pm on Sunday 10th June. Bids can be placed in person here at the Courtyard workshop, (DAW venue 36) or via our Facebook page. You can keep up to date with the auction on twitter, facebook, and this blog. You will also be notified by email or by phone if you have been outbid. 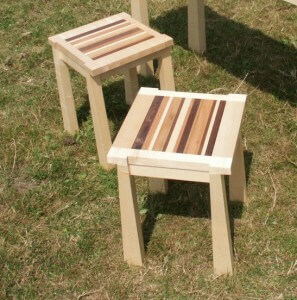 It’s worth also saying that there are pieces of furniture which are not in the auction, including our last edition ‘Torii’ side tables, some new and exciting garden furniture, the still fairly new ‘Gabriel’ chair, plus one or two surprise pieces. The Banquet dining table is as a contemporary twist on the refectory table. The ash top is bleached and scrubbed with boiling water and a wire brush creating a beautifully textured white surface. 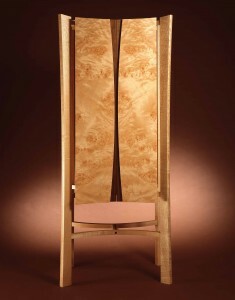 The frame and top details are made of Scottish elm. It will seat 8 to 10. Dimensions: 230cm x 92cm, 75cm high. The cabinet is made with two very unusual timbers. The dark wood is from a Dorset American black (Virginia) walnut tree, which grew as part of an avenue of trees to a large house, now a private school. 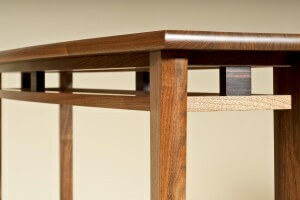 It has an entirely different colour to commercial imported black walnut and is stunningly beautiful. The inside utilises a pippy of ‘birds eye’ sycamore, which is lit, creating a warm glow of colour ideal for collections of ceramics or glass objects. Dimensions: 148cm x 45cm, 90cm high. 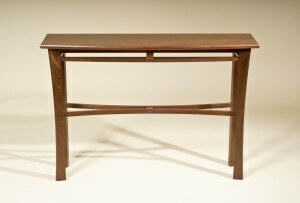 A beautiful and delicate console table full of sweeping curves and a repeating square detail motif. We currently have two similar tables, this one in English walnut with ebony details, the second in native grown black walnut and burr elm. The perfect piece for a hallway in my favorite timber. Dimensions: 115cm x 31cm, 75cm high. The sister piece to the table above. This is a native grown ‘black’ or American walnut, it’s not the same colour as the imported stuff you see everywhere, it has deeper red and purple tones – very unusual. The burr elm square details set those colours off perfectly. A beautiful and delicate occasional table looking for a home! 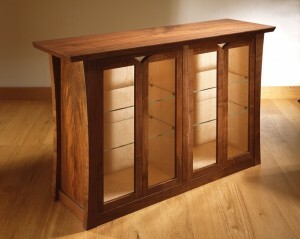 A really striking piece, designed as drinks cabinet with adjustable glass shelves inside. The cabinet is suspended within an offset framework making it appear to float. The doors have a finger scollop running top to bottom with English walnut set within. The door faces have a burr sycamore on the surface, I’ve only ever seen this once so I bought as much as I could afford! Dimensions: 78cm x 45cm, 180cm high. This was part of an experimental range of pieces where the top is made of a panel of random pieces of timber from our off-cuts rack. Although I say random it takes ages for me to arrange the sequence and even longer to glue and sand, but the effect is pretty. 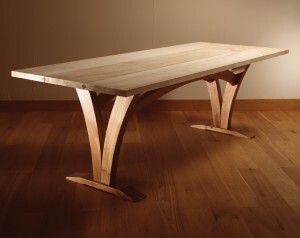 The frame is made of native sycamore, the other timbers are black walnut, oak and lacewood. This needs to find a spot, it’s a bit of a long shot, but someone out there is looking for something just like this for that awkward alcove or corner they just can’t think what to do with. It was part of a set of 5 shelves that locked together forming a very abstract, random formation. All the other pieces were different widths. In the end the client felt this centre one was a bit too narrow for an important piece of ceramics they wanted displayed, so we made a new wider centre section. We could add a shelf in that very tall alcove where the ceramic piece was placed. It does have an overhanging lip on the sides and top so could be fitted into a larger alcove space or have one built to house it. • All items are ‘sold as seen’ and are non-returnable to Simon Thomas Pirie Furniture (STP). • Bids increase in £25 increments. Latest bids will be displayed on STP website, STP Facebook page and other social media outlets, as well as in the Courtyard Gallery. • Bidders will be asked to leave name, address and contact details. We reserve the right to contact a previous bid if a current highest bid cannot be contacted. • ‘Buy it Now’ purchases to be paid for on the day to secure item and remove it from auction. • Current highest bidders will be advised if they have been outbid by phone, email or text depending on preferred contact method. • VAT is charged at 20% and included within above costs. • All costs are ex-delivery. We are able to deliver within a 50 mile radius for £60 / within 100 mile radius for £120. Above that we charge an additional 40p per mile. Any congestion charge / tolls will also be added to delivery costs. You may also organise your own transport. • Delivery details to be agreed on bid date with STP. • All bids must be received by 5.00pm Sunday 10th June 2012. • Once payment has been received in full delivery or collection can proceed. • All pieces to remain on show until June 10th – except for in exceptional circumstances.